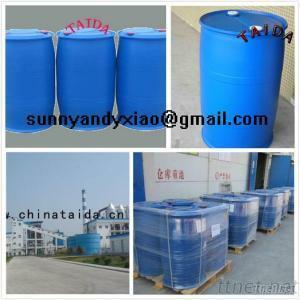 Xinji City Taida Sinopec Co., Ltd.
Hydroxyacetic acid is also called Glycolic Acid/Hydroxyethanoic Acid. 1. Its 70% solution can be used as cleaning agent. 2. The mixture of glycolic acid 20% solution and formic acid 1% is a highly efficient and low-cost cleaning agent used in air-conditioning, boilers, running piping, electrical plant, dondenser, heart exchanger, etc. 1. Used in the fine synthesis of medicine. 2. Used as ingredient of cosmetics, adhesives, petroleum emulsion splitter, soldering paster and coatings. •Cosmetics: It is used as emulsifier, penetrant, detergent, softener, lubricant, disinfectant, dispersing agent, antistatic agent, hair amendment and so on. •Chemical industry: It is used as polymer emulsifier, plastic rubber releasing agent, polymerization stabilizer, reservoir oil chemical additive, crude oil emulsion breaker and so on. •Mechanical industry: Chemical additive of plating solution and metal cleaning liquid, metal antifouling agent, metal lustre-coating agent, electronic component welding flux, chemical additive of battery solution and so on. •Photosensitive industry: Wetting agent of light sensitive film, emulsifier, stabilizer, antistatic agent and so on. •Pharmaceutical industry: It is raw material of synthesizing line and high polymer material. •Textile industry: It is dyeing agent of wool and acrylic fiber.